The Party of NO gets a public spanking... Sorry, boys! BALTIMORE – Banana Republican Congressmen invited President Barack Obama to lunch today for a “debate.” Unfortunately, the Banana Republicans brought their knives to a gunfight. President Obama refuted each and every one of the Right-Wing-Echo-Chamber-spawned talking points so definitively that the Banana Republicans were left utterly discredited and completely incoherent. Even with over one hundred Banana Republicans ganging up on the President, they could not lay a finger on him. The only thing Banana Republicans were able to accomplish was to agree to continue saying “NO” to any proposal for anything other than more TaxCutsForTheRich. For some reason, no matter what the situation, in good times and in bad, for a Banana Republican, there is always a rationale for that. 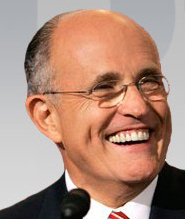 NEW YORK – Notorious cross-dressing Banana Republican former Mayor and staunch President MORON apologist, Rudy GHOUL-IANI (whose only reaction on Nine-One-One was to politicize his personal failure to protect the citizens of New York), was exhumed briefly today for a truly bizarre mission. Thinking the extreme cold would somehow preserve his decaying gray matter, Banana Republicans sent him out to appear on ABC’s “Good Morning America” and claim that there had been no terrorist attacks under his beloved President MORON! He also claimed that there had been one such attack under President Obama. The befuddled senior citizen seems to have forgotten his own mantra over the last eight years or so. Had he not been such a crassly immoral and abjectly opportunistic politician during his productive life, his decline might have engendered sympathy. Oh well.